The iBook based on the popular book by Richard Moon, **Aikido in Three Easy Lessons** teaches powerful life skills drawn from Aikido, the Art of Peace. The iBook combines the best of the a clear written description with explanation and demonstration on video. The iBook based on the popular book by Richard Moon, Aikido in Three Easy Lessons teaches powerful life skills drawn from Aikido, the Art of Peace. The iBook combines the best of clear writing and explanation with demonstration on video. The book is now available as a video book (iBook) for iPads and Apple computers. Aikido in Three Easy Lessons teaches the essential principles of this powerful art in a way that can be applied to every aspect of life, from personal development and personal power, to relationships to business success, from the development of our economic political and educational systems, to the development of a sustainable world, where through the power of harmony all our forces are applied to create a beautiful world. The iBook include the full text of Richards book and also 32 minutes of video instructions. This is a 6th degree Black Belt, began his career in martial arts by studying Shotokan Karate, Kenpo, and Kung Fu under various teachers. In 1971 he began his study of Aikido under Sensei Robert Nadeau. 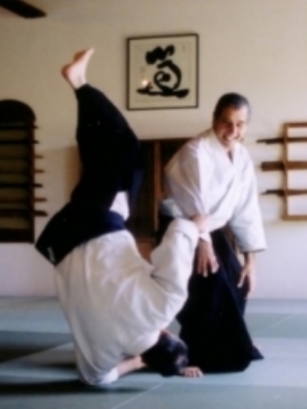 Richard is the founder and head instructor of Aikido of Marin. Founder of The Listening Institute specializing in creativity and communications, Richard is also a partner in the Quantum Edge, a consulting firm specializing in master coaching for executives and their teams. A skilled mediator and facilitator, he leads training in negotiation, sales, peak performance, team process, and communication. Richard also has in-depth experience in music, dance and various forms of Yoga. Richard is the author of Aikido in Three Easy Lessons. Which was also produced as DVD (Trailer to DVD). The video is available on line now as a rental.